Cute? Sweet? Adorable? Whatever words come to mind, here are some fun facts and adorable pictures of just a few of the lovable creatures at the Tennessee Aquarium that make us all say "awwww..."
Did you know? The Tennessee Aquarium is home to more turtle species than any other zoo or aquarium in the U.S. Fun tip – chicken turtles can be identified by viewing from the back, because they appear to be wearing striped pants. 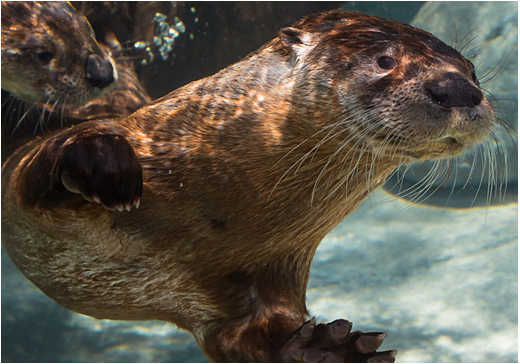 River Otters use special flaps to close off their nostrils and ears when underwater. These amazingly talented swimmers can remain submerged for up to eight minutes on one breath! Miss otter antics between aquarium visits? Catch all the action on the River Otter Falls Webcam. Gentoo Penguins, the third largest penguin species, are known to be the most curious of all penguins. Their roommates, the Macaroni Penguins, are excellent climbers and are known as the “alpine penguin” because they will scale cliff faces just to find the perfect nesting areas. Both types of penguins love to "fly" using their strong, heavy wing bones that make it easy to propel through the water. Curious what the penguins are up to today? Check out the Penguin Rock Webcam. You don’t have to travel to Madagascar to see these adorable, furry-faced mammals. If you venture into the Lemur Forest, you’ll come across the Red-ruffed and Ring-tailed lemurs that often like to run, jump, and swing from treetop to treetop. On sunny days, you can catch them “sun worshipping” beneath the Aquarium’s peaks! Insects cute? OK, maybe not what comes to mind, but they are oh so beautiful. And with newly hatched butterflies released daily, the Butterfly Garden is one of our favorite places. Have any butterflies ever landed on you?